The Janus (ex-Pimco) fund manager anticipated a slump for German debt and Chinese equities; Janus Global up 0.8% in July, 1.6% YTD. Gross accurately predicted earlier this year that German government debt and Chinese stocks were poised for a slump, but didn’t directly wager against these markets. Instead he sold insurance on German bunds, which depressed returns at his Janus Global Unconstrained Bond Fund in late April and May when the bonds fell faster and further than Gross had anticipated. Now the manager known as the bond king has recouped some of those losses after adjusting his strategy. He has sold short German bunds and the U.S. stock market, which he said would become more volatile when Chinese equities sink. His bet against equities equaled almost 10 percent of the fund’s assets as of June 30, according to documents on Janus’s website. Gross’s strategy “looks good on paper, if you can hedge sufficiently so you are not going to lose your shirt if the market does what you don’t expect,” said Abraham Goodfriend, managing director of Yedid Capital Management, an investment adviser that specializes in options strategies. “There are a lot of moving parts here, so you have to have excellent execution” of the trades, along with good timing and precise calculations on the value of derivatives. Janus Global has returned 0.8 percent during the past month, ranking it at the top of 41 unconstrained bond funds tracked by Bloomberg. Since the start of the year, the fund gained 1.6 percent, a performance that places it ahead of 90 percent of peers. Erin Freeman, a spokeswoman for Denver-based Janus Capital Group Inc., declined to comment. 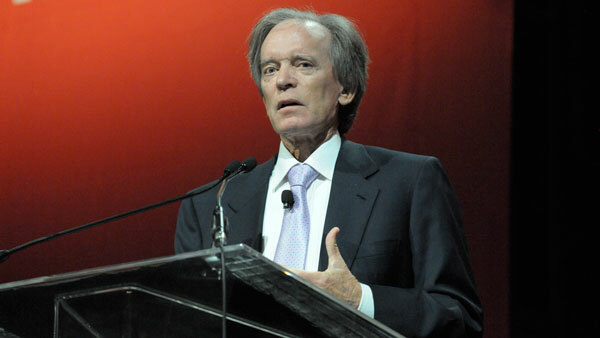 Gross is using the short positions to hedge trades he put on to benefit from inflated fears over volatility. In return for premiums, his fund enters into options contracts with investors seeking protection against losses on stocks, bonds and currencies. He’s betting that investors are overpaying to shield themselves from big swings and that markets ultimately won’t move too much in either direction — the upside capped by lackluster economic growth and the downside supported by central banks ready to step in as soon as markets get shaky. Gross put this strategy to work when he identified his first “short of a lifetime” on April 21, urging investors to bet against the 10-year German bund. Yields on the bonds touched a record low of 0.049 percent on April 17, down from a high of about 1.5 percent a year earlier, as the European Central Bank embarked on a plan to purchase 60 billion euros ($66.9 billion) of debt each month. Instead of actually shorting German bunds, Gross sold put and call contracts on futures tied to the debt, a wager that they would trade within a narrow, less volatile, range than prices on the derivatives implied. In writing this insurance, the fund became exposed to losses when the bonds plummeted more than Gross had expected the following month. Janus Global fell 3.3 percent during the last week of April and the first two weeks of May, marking the fund’s largest loss since Gross took over in October. “Our position on the bund involved selling volatility using options without taking a directional stance,” Janus said in the second quarter report posted on its website. After seeking to limit the fund’s losses from the initial trade, Gross once again sold options on German bunds, only this time he also shorted the German government debt. “We then re-instituted exposure to bunds, still short volatility, but more directionally focused — short German debt — as this better aligned with our macro view,” the firm said in the second quarter report. The report shows that Gross also used the nuanced approach for his second short of a lifetime that he broadcast through a Twitter message on June 3, predicting that Chinese stocks were overheated and poised to fall. China’s Shenzhen Composite Index, having more than doubled in 2015, began declining about a week after Gross made his call, and has since plunged about 27 percent. Rather than shorting Chinese stocks, which he described as a dangerous market to play, Gross said he has been wagering that the Shenzhen Index’s downturn would lead to volatility in more liquid markets, ranging from foreign currencies to U.S. stocks. As of June 30, Janus Global had sold put options on the S&P 500 with an adjusted face value equaling about 9.5 percent of its assets, according to the Janus website, along with call options totaling about 1.9 percent of assets. Under the put contracts, which began to mature on July 17, Janus Global would have had to begin paying money to investors who bought the put options had the S&P 500 slipped below 2020. At the same time, the fund also had a short position on the S&P 500, comprised of futures contracts that mature in September, equaling 9.46 percent of net assets at the end of June, according to the website. The intended effect from this brew of different derivatives: losses on the put options would be offset by gains on the S&P 500 short position. Should the S&P 500 rise instead of fall, however, the income gained on the put contracts might not offset losses on the Janus fund’s short position on the S&P 500.